The story didn’t end after Jesus rose from the dead– in fact, it was just beginning. The book of the Acts of the Apostles and the letters of Paul and his peers help us remember what was happening during that time. The new “Christian church” had to figure out who they were and what they were all about. Who could belong to this group? Who was leading them? What was their relationship to the local religious leaders and synagogues — and to the Roman Empire? AND: what do all those questions and stories mean for us today? In Church To Go we’ll be trying out something new. 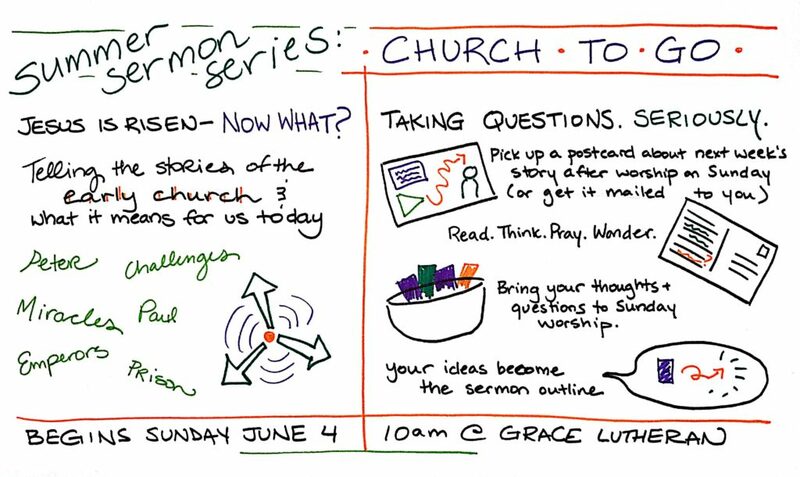 After worship on Sunday, you’ll receive a postcard with an illustration of *next* Sunday’s reading — along with additional Scripture readings, historical notes, prayers, questions, and plenty of space on the back to write down thoughts and wonderings. (If you don’t make it to worship, we can mail the postcard to you!) You can take whatever time during the week to think through the coming reading and take note of *your* questions about it. Then on that Sunday, your questions and thoughts go into a basket — and that basket becomes the outline to the sermon. Bring yourself. Bring your friends. Bring your questions. Together we’ll figure out what to do with a church that is on the move! – August 27, 2017: How do we listen to Bible stories that are hard to hear? – September 3, 2017: What does our suffering say about God? – September 10, 2017: What does genuine love look like?